Yu-Gi-Oh! VRAINS episode 2: "Seize the Wind!" Jin Kolter, known as Jin Kusanagi (草（くさ）薙（なぎ） 仁（じん）, Kusanagi Jin) in the Japanese version, is the younger brother of Kal Kolter and a character in the Yu-Gi-Oh! VRAINS anime. He was one of the victims of the Lost Incident, and his Ignis partner was Lightning. 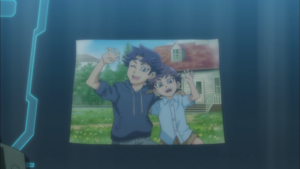 During the second season, Jin's soul is kidnapped by Bohman, prompting Yusaku and Kolter to pursue it. Jin is a fair skinned teenage boy and he strongly resembles Kolter. Like Kolter he has grey eyes and purple hair, but his hair is long and unkempt, reaching past his shoulder and it is lighter shade than his brother. He is depicted wearing a dull-colored shirt with sleeves ending halfway down his elbows and pants. As a child, he had short hair and wore a short-sleeved, light blue shirt and a pair of khaki shorts. In LINK VRAINS, Jin retains the same appearance, but wears a more ornate outfit. He wears a white sword-shaped mantle with a gold border and a purple tip and shoulderpads, which are tipped with gold pauldrons. The mantle has a prominent black high collar lined with golden and patterned with a lightning symbol. Under this mantle he wears a long white coat with a purple band at the hips below an orange belt, and with golden edges. He also wears black gauntlets with golden cuffs, white boots with black soles, and black "flared" pants. As with other members of Lightning's organization, he has Lightning's star symbol on his outfit; an orange version on his mantle over the chest and prominent golden ones embedded in his gauntlets and boots. A photo of Kolter and Jin as children. According to Yusaku after being rescued from Hanoi Project Jin developed intense PTSD and even now he is still suffering from PTSD. Since the events of the Lost Incident he has become withdrawn,reserved and closed of his heart from the world. As a child based on the picture of him and prior to getting kidnapped for Hanoi Project he appeared to be cheerful and outgoing. Both Jin and Yusaku were victims in the Hanoi Project 10 years ago. Despite having been rescued, he is still suffering from the shock of the incident. This event drove Yusaku to fight for him, and defeat the Knights of Hanoi so that Yusaku might save him from darkness. Jin is mentioned several times by Yusaku Fujiki and Kolter during their fight against Hanoi. After Kolter discovered the true identity of Blue Angel who is Yusaku's classmate and step sister of SOL Technologies Security Manager Akira Zaizen Kolter suggests Yusaku meet her so that he can get a lead on Akira regarding Jin as well as Yusaku's stolen memories but he doubted the plan would work due to Yusaku's poor social skills with women. He was indirectly mentioned during Playmaker's Duel against Varis as the former vowed to Varis that he would save him. While Yusaku and Kolter were deleting the files of Playmaker that people post on the network, Yusaku wondered if it was wise to seek Varis out for answers about Yusaku's past and about Jin. When Kolter was writing his report, he also wrote that he still thought of his brother, Jin, and wished that the reader of this report would tell that to his brother when they meet him. ↑ 1.0 1.1 1.2 Yu-Gi-Oh! VRAINS episode 29: "Kolter's Khronicles"